The Bolingbrook Babbler: Fortunetellers: Will County is doomed! The Will County Association of Pre-cogitation announced Friday that Will County faces certain disaster. "We do not know what the disaster will be," Said Mistress Disa, "but today, fate has conspired to endanger Will County!" Donna Moonfire said she had a sudden vision of Will County's demise. "This morning, I dreamed of red skies. Then I heard a siren, or maybe it was a scream. Then I woke up. " Desiree Jones said she frantically tried to discern the cause, but she has been unsuccessful. "There is too much negative energy coming from the county board." She said. "It's clouding my vision of what could be a very deadly future." Disa urged local officials to take their warnings seriously. "Maybe it's just a bad storm. Maybe it's a coming firestorm. Maybe the spirits have cursed Will County. Or maybe it's just a red sky. But why take the chance. Why risk the lives of thousands of innocent voters, when we are willing to work with the county board?" Moonfire accused the board employing skeptics and people with "negative energy" to disrupt their readings. "The board is obviously concerned about people with our talents spying on our meetings. We've sensed that they've hired anti-psychics to block our talents. Unfortunately, these individuals are also blocking our ability to see this impending disaster." "I can't stand to watch board meeting on TV." Said Jones. "Why would I want to watch their meetings using my talents?" "Again, we will work with the board," Said Disa, "But the board has to work with us, and we can only discuss our terms in private, so as not to unduly disturb the balance of energy in Will County." When asked for comment, a spokesperson for the Will County Board replied, "I'm sorry that our new zoning requirements for fortunetellers are an inconvenience for some. But they should have known about this change long before the board ever thought of it. We will not be blackmailed by so-called threats from the future." A spokesperson for the James Randi Educations Foundation denied that their organization is working with the board. "If any of these psychics would like a million dollars, we'd be happy to test them." Disa declined on behalf of her organization. 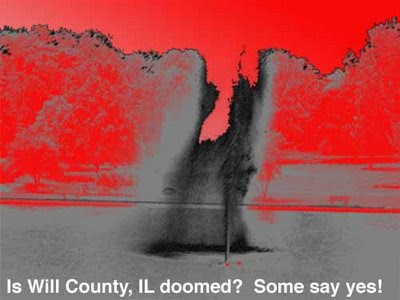 "Will County is doomed, and they want to test us?" Claar: Public can speak at board meetings, but for only 10 seconds, and they must speak in rhyme. Aliens infiltrate Galena UFO believer golf outing.